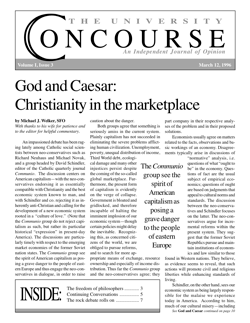 I write regarding Kathleen van Schaijik’s article on NFP in the February 13 issue of the Concourse. I was pleased to see this sensitive issue being discussed. I agree that we must becareful of judgementalism, since often we cannot judge whether or not one is in a state of sin. However, when the question is not sin, but the level of virtue one exemplifies, I believe we need to admit that some people display a particular virtue to a greater degree. For instance, when one sees the distinctive habit of a Sister of Charity, one thinks of the selfless love with which Mother Teresa ministers to people in need. This is impressive and in no way diminishes the love with which other religious serve people in their care. Just the same, when one sees a large family, as did the doctor refered to in her article, the blessing and generosity is obvious. This fact should not diminish the generosity of families whose blessings are less obvious. This also does not make one “more Catholic” since one is either Catholic. . . or not. The issue then cannot be “Catholicity.” It is in fact generosity. I too have been impressed by large families, but this is not just my opinion. It is also the Church’s. There are two roads for responsible parents: generously raising a large family or the decision to postpone this for grave motives. The issue then is the meaning of “grave.” It is also the word used to qualify the matter necessary for a sin to be considered mortal. It seems to me the scope of meaning appropriate for the word “grave” in reference to mortal sin is the one that should also be used to determine the meaning of “grave” in reference to reasons to use NFP. I am grateful for the opportunity Carol Puccio gives me to clarify my thoughts on this topic. I do freely admit that many big families emanate the virtue of generosity. I will even happily grant that the Church has a certain “preferential love” for big families (I have it myself), in the same way she has a preferential love for the poor. My objection is to those who take this preference as a warrant for claiming that couples who choose not to have large families are thereby compromising in their vocation. Just as her preference for the poor does not justify us in presuming that unpoor Catholics (who, after all, could be poor, if they chose) are compromising in their commitment to the Faith, the Church’s praise of large families in no way implies that all families should be—if they could be—large. I cannot agree with Puccio’s having the discussion hinge on the word “grave.” To me the meaning of the term is clear enough: it means serious, weighty, important; it is the opposite of unserious, frivolous, insignificant. Did I ever in my article suggest that it was okay to use NFP for less than serious reasons? I think rather that part of the “providentialist problem” comes in with an unnatural stress on this word, which distorts is plain meaning, almost making it seem synonymous with “life-threatening.” I do not accuse Puccio herself of meaning this; indeed, I imagine we are really very close to each other (if not perfectly unified) in our opinions on the subject.